Our sister site firstaidpowerpoint.org provides free first aid PowerPoint presentations for anyone to download and use when teaching first aid. We haven’t updated the site in a while. As a result, we’ve now started a programme of improvements and updates to our first aid powerpoint presentations. To kick of this, we’ve uploaded a brand new first aid presentation! First aid for Anaphylaxis covers the basic principles of first aid treatment for anaphylaxis (a severe allergic reaction). 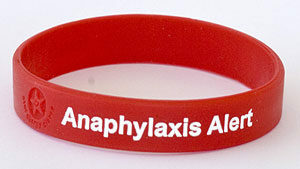 Our Online Anaphylaxis Awareness course provides more information on the causes, symptoms and treatment of Anaphylaxis. Over the next few months we’ll be uploaded more free presentations for first aid trainers. If you’ve got any suggestions then please use the contact form to get in touch. I love PowerPoint presentations. This is a very useful tool! Thank you for sharing! Hey, it’s fine that you guys were gone for a while! It takes a bit to go and create comprehensive new content, especially in a subject such as first aid. I’m looking forward to seeing more great powerpoints from you guys in the future!